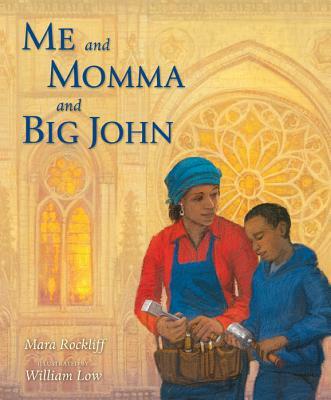 Momma is a stonecutter at the cathedral called Big John — and little John and his sisters can't wait to see her special stone — in this luminous true-life story. "Building a cathedral isn’t a job, it’s an art." Momma comes home from work, tired and sore from a long day at her job. She used to work on the factory line, but now an early bus takes her across the bridge into New York City. Momma is a stonecutter now, helping to build the Cathedral of Saint John the Divine. She works all day on just one stone, and little John and his two sisters wonder how she does it. Finally, Momma’s stone is finished, and little John can’t wait to see it. But when he arrives at the cathedral, he’s confused. Where is Momma’s name? How will all the people know this is Momma’s art? This touching story from a child’s perspective, based on real events, lovingly shows the grace and dignity of having pride in one’s work — and in one’s Momma. Gorgeously illustrated with the illuminated artwork of William Low, the transcendent beauty of Saint John’s Cathedral radiates with warmth and light. William Low is a much-lauded illustrator, author, and painter who has received numerous awards. His books include Chinatown and Old Penn Station. He lives in New York City. With Rockliff’s plainspoken lyricism providing scaffolding for Low’s incandescent realism, the story of a struggling family transformed through the joy and power of meaningful work is woven into the history of a beloved spiritual landmark. Whether the scene is inside the narrator’s modest apartment or looking down from the barrel vault ceiling onto the cathedral’s magnificent nave, every page is infused with golden light, quiet pride, and soaring hope. Rockliff’s lyrical text celebrates collaboration and communion, whether as voices rising in a cathedral hymn or among the skilled workers who labored over more than a century. Low renders many gorgeous digital spreads, articulating the extraordinary light and deep shadows within and outside the architecturally splendid cathedral. Both text and pictures radiate a sense of the dignity and pride felt first by this African American woman and then by her son. Low’s impressive digital illustrations create a vivid sense of place, particularly at the cathedral. A quiet but beautiful picture book. The story is quiet and serious, honestly showing Momma’s exhaustion at the end of the work day and thoughtfully exploring the boy’s growing understanding of the building project (“I think about the hands that worked on every stone until it was exactly right, knowing that it had to hold up all the rest”). It’s an effective solemnity, underscoring the importance of taking the time to do something right and putting effort into ensuring beauty and strength. This is the rare children’s book that shows how a building is built with less of an emphasis on cranes and bulldozers and more on the difficult work of laboring hands. But it's not only about the grueling hardness of labor; ME AND MOMMA AND BIG JOHN is also about the rewards of a labor of love, and of a job well done. Rockliff’s story is told in lyrical prose with a heavy dose of figurative language. Low’s incandescent illustrations beautifully complement the descriptive text. Light and shadow are cleverly used to help set the mood and tone. Luminous digital paintings create warm family scenes and bright cityscapes, and capture the majesty of the building. Light and shadow are deftly employed to create drama and depth, heighten emotion, and portray the sacred nature of the structure and the spirit of community it engenders. Featuring a close-knit African American family, this is a lovely addition. If Mara Rockliff’s ME AND MOMMA AND BIG JOHN does nothing else (and it does a lot) it leads kids to understand that for every great awe-inspiring behemoth in their lives, there were countless everyday joes working hard, making a living, turning pencil sketches on blue paper into reality.